"Get Your 35 Hours Contact Certificate for the PMP® Exam Application Now and Pay for the Prep Classes Later"
"Get your Certificate for 35 Hours of Project Management Education Without Attending the Prep Classes"
To stay unique from other institutes, School of PM offers Risk Free Enrollment for its students. 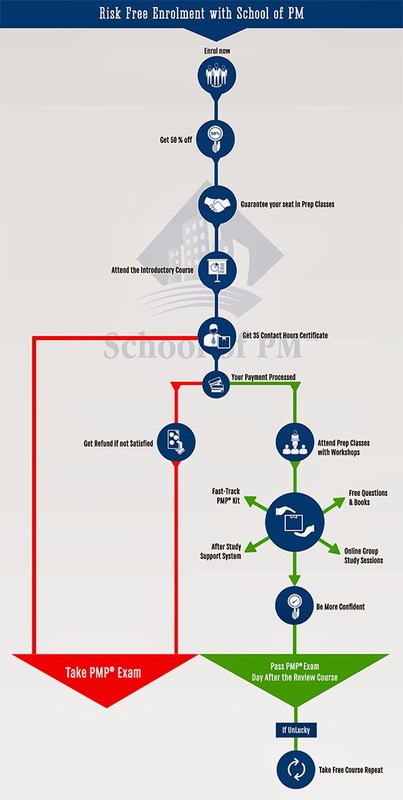 Students can enroll with School of PM without any initial payment. The payment process will be delayed until the first prep class starts. The course fee is fully refundable, even after completing the introductory course and obtaining 35 hours of Project Management Education. Register and Take Advantage of our Risk Free Enrollment! No payments are required until three weeks before the start of prep classes. Register now, pay later. Register early to receive the early registration discount and secure your seat for the prep classes. After registering, you can take advantage of our online Introduction to Project Management Course. Once the introductory course is completed, you can print your certificate for 35 hours of Project Management Education which is required for the PMP Exam application. The School of PM also offers a flexible cancellation policy. The course fee is fully refundable, even after completing the introduction course. Notice of cancellation must be received within 14 days prior to the first prep class. Be smart. Take advantage of this special offer. Enroll yourself now in School of PM and earn the 35 contact hours that meet your requirements.